Pulitzer Prize winning Ellen Goodman entered the journalism world at a time when there were no female journalists. She also had no intention of making writing her career. She had never written for the school newspapers, never took an English class, and didn’t know what she wanted to do when she graduated from Radcliffe/Harvard. She applied for a position as a researcher at Newsweek and worked the wire, because that was a woman’s job. She worked under writer Peter Benchley a friend, and former classmate. From there she discovered that she enjoyed writing and moved on from Newsweek, taking a position with the Detroit Free Press. 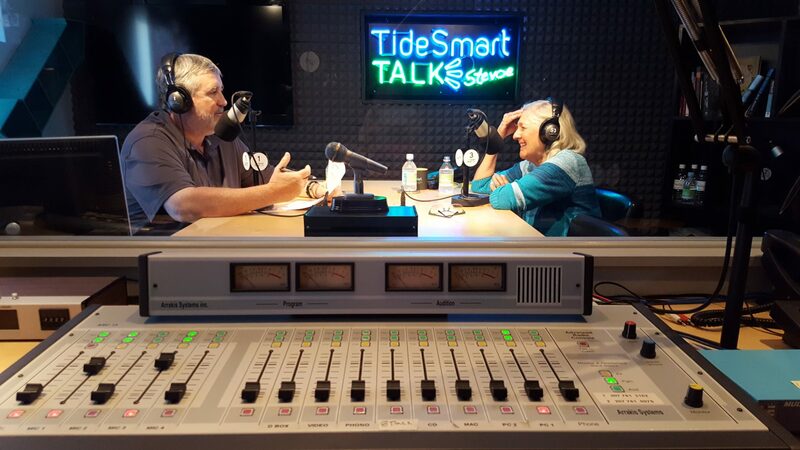 Host of TideSmart Talk with Stevoe, Steve Woods, welcomed Ellen Goodman (at right). When it comes to writing, Goodman recounted advice she’d been given at the start of her career: “You can be good, you can be bad, but you can’t be late.” This is how she began writing Op-Ed columns. In the 60’s, she had taken a job back east working for the Boston Globe and they opened the Op-Ed space up to in-house writers instead of just syndicated writers. Goodman found that when she only wrote about topics that interested her, it was easy to do. It was especially meaningful to her at the time because there were still so few female writers and she found herself being the “female voice” of the newspapers. She described her articles as breaking down the wall between personal life and professional life. She had been writing articles weekly until the 1970’s when the Washington Post asked to syndicate her articles and she really began writing full time. Goodman said that when asked what she does for a living she responds, “I tell people what I think.” During the 60’s and 70’s when she really started to make a name for herself, she described the style of writing as “new journalism” where writers and authors had permission to write whatever they felt was important. She says this was the key to her emergence as a writer. She officially left her column at the Globe six years ago, but she certainly hasn’t retired. Goodman has kept busy with a pet project: The Conversation Project. The Conversation Project stems from an oft written-about topic for Goodman. When her mother passed away, she realized how many people struggle with end-of-life decisions – no matter how it happens. She found that by having conversations and plans about death, it eases anxiety and reduces the chances of depression for everyone involved. Her goal is for every person and every family to designate a “decision-maker” (otherwise known as a proxy). Goodman says that half of people over 65 who go into the hospital do not have the ability to make decisions about their health. To learn more about The Conversation Project, go to theconversationproject.org. To learn more about Ellen Goodman and her career, listen to the interview below. Posted on Monday, August 8th, 2016 and filed under Show Recaps.